This past weekend, Turnbull Manufacturing Company completed their second season giving firearms away at Texas Motor Speedway. On Friday after qualifying, Doug Turnbull presented Greg Biffle and the #16 team with a Turnbull Model 1886 rifle. 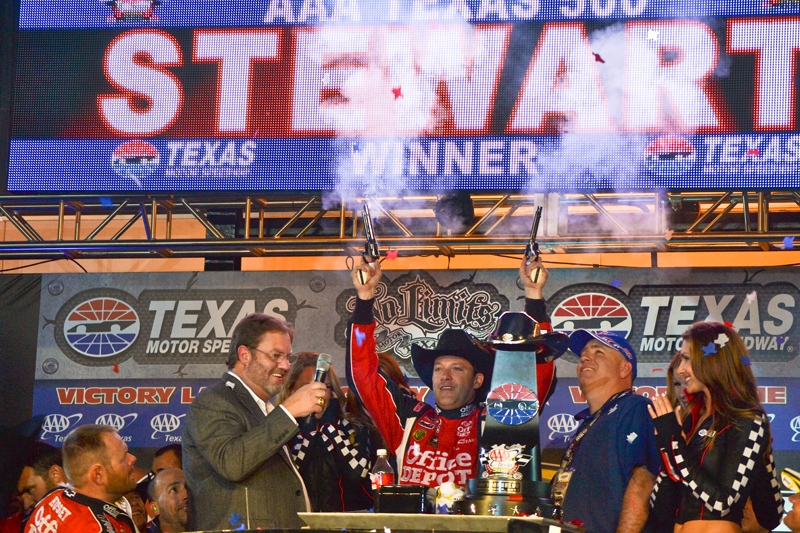 On Sunday, after the AAA Texas 500 NASCAR Sprint Cup Race, Doug Turnbull presented the winner, Tony ‘Smoke’ Stewart and the #14 team, with a pair of Turnbull Mfg. Company custom revolvers. Tony fired off the guns ‘Texas-Style’ before he was presented with his trophy. Congratulations to both Greg Biffle and Tony Stewart for being the latest NASCAR drivers to win our guns!